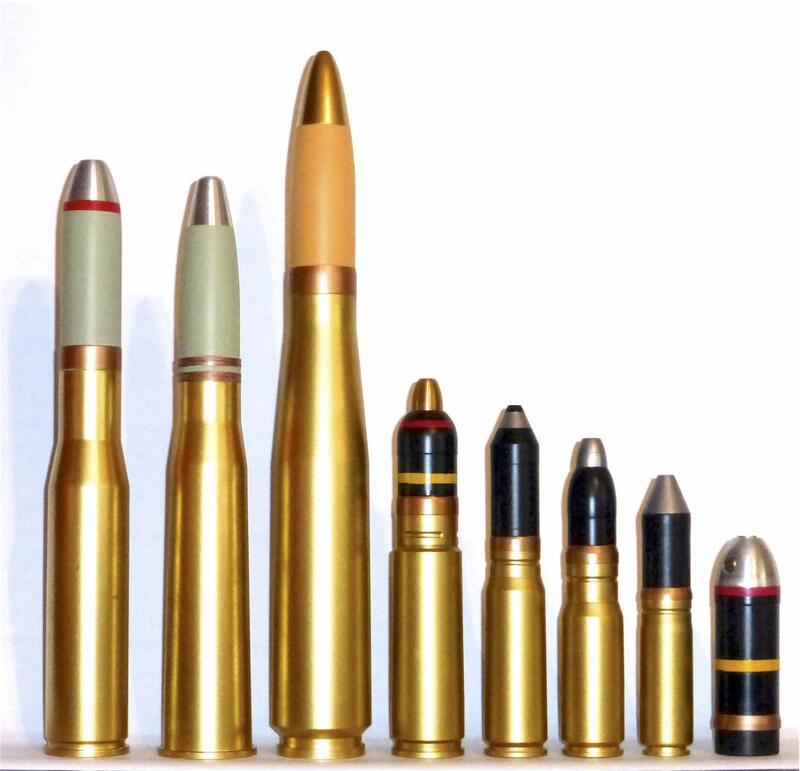 For those of us who like to collect different case types within a category of ammunition, there will always be those elusive cartridges which are so rare as to be either unobtainable, or far too expensive for most budgets. This provides the opportunity for fakes and replicas to flourish. First, I had better distinguish between them. In both cases, every effort is made to reproduce the appearance of the genuine article. The difference, in my opinion, is that a fake attempts to confuse people into believing that it is genuine, whereas a replica does not. The difference is usually in the headstamps: a fake will copy a genuine headstamp, whereas a replica will not. Fake cartridges may also be treated chemically to make them appear older than they are. The final difference is, of course, that a fake will be priced to sell as if it were genuine, a replica will not. Many collectors will reject anything other than the genuine article, whether it is a fake or a replica. Others, including myself, are interested in obtaining representative examples of different cartridges for comparative purposes and, if the genuine item is not available, will purchase a good replica. 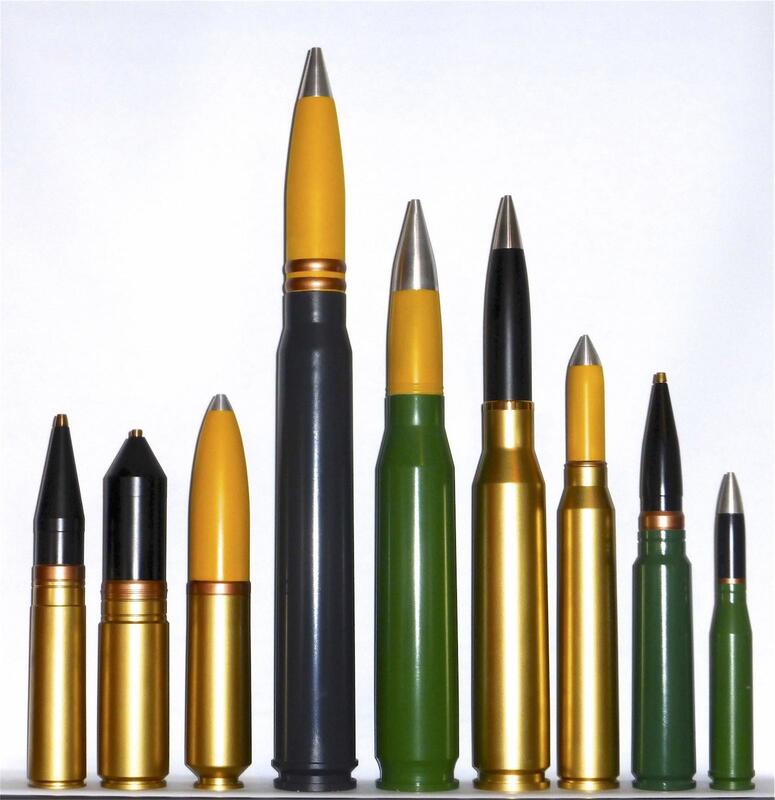 They are (from left to right): 13x77B, 13x91 (Italian, by Breda), 13x94 (PzB; interim between 13x92SR and 7.92x94 PzB), 13x100B, 13x105, 15x135 (20/15mm Polte), 20x135 (Polte), 20x138RB, 24x138B (the 20x138B necked out), 30x91 (MK 212: Mauser's rival to the MK 108), 30x110B (French MK 253 post-WW2). The above photograph shows a number of replica cartridges from my collection. The projectiles are genuine but the cases are replicas, except for the 24mm which appears to have a replica projectile in a modified 20x138B case. 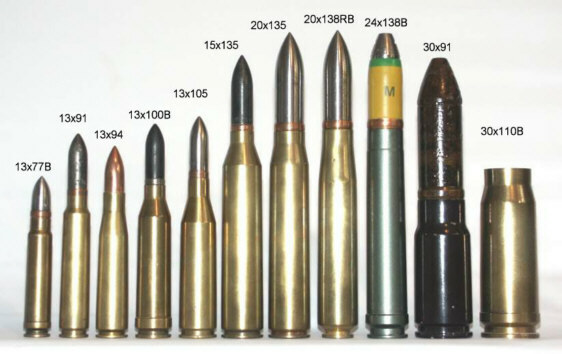 The cartridges are all experimental and some may never actually have been manufactured; I believe that these examples have been made from factory drawings. The headstamps in all but the 24mm consist of an 'R' in a circle to indicate that they are replicas. These are mostly German WW2 rounds which have been reconstructed from factory drawings (although the projectiles are genuine). Any more detailed information about these rounds would be welcomed. I did at first think that the 20x138RB might be the MK 108/20 for which drawings exist, but the case is too slender. In recent years I have decided to have replicas of impossible-to-get rounds made for my collection, for the purpose of comparative photos of the sort which I use extensively on this website. ECRA member Mick Wilkinson has kindly taken on the task of having these made, with the complete rounds lathe-turned in one piece from solid aluminium - so no chance of anyone mistaking them for the real thing! The following photographs illustrate the collection; in addition, Mick has made for me some replica projectiles (also solid aluminium) to fit into genuine cases. From left to right: 45x186 (Soviet WW2 NS-45 a/c); 57x165RB (Soviet late-1940s N-57 a/c); 55x175RB (German WW2 MK 112 a/c); 55x450B (German WW2 Geraet 58 AA / MK 114 a/c); 50x335 (Oerlikon late-1950s 501 MK AA); 42x348 Oerlikon early-50s 421/2 RK Red King AA); 34x291 (late 1940s Vickers Class T AA); 37x240 (current Chinese Type 76 AA); 25x183B (current Chinese PG87 AA); all experimental apart from the Chinese rounds.